I don’t know about you but it’s always refreshing to wake and find news of an update – especially when it contains fixes to issues you’ve encountered – and so it is that we have an October 2015 update for the Office2013-based version of the Lync and SfB client. This one takes the Office 2013-based Lync/SfB client from 15.0.4753.1000 to 15.0.4763.1001. A few people have found their recent updates haven’t delivered as expected. Don’t forget *all* of the pre-req’s. 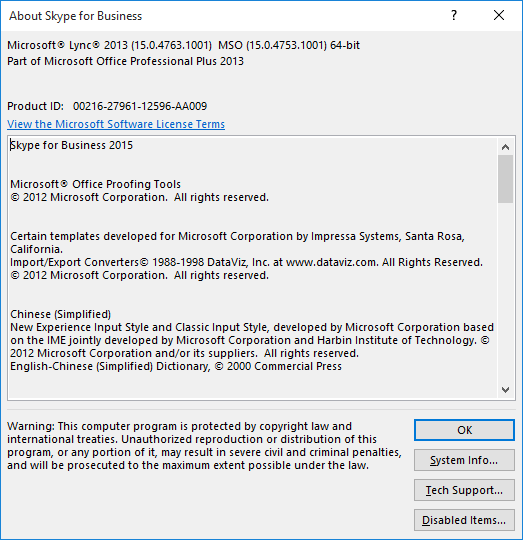 The Office 2013 SP1 requirement still applies if you’re using Office 2010. (Lync 2013 in all of its flavours – e.g. Lync Basic – is still a component of Office 2013). NOTE1: “Before you install this update, you must install Microsoft Office 2013 Service Pack 1 (KB2817430)”. 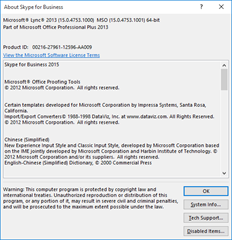 NOTE2: “You do not have to apply update KB3054853 if you applied the April 14, 2015, update (KB2889923) or the May 12, 2015, security update (KB3039779) for Lync 2013 (Skype for Business)”. I have all the pre-req’s already installed, so a reboot was not required. The further behind your current client version is, the greater the likelihood you’ll need to reboot. Note that I installed the update having exited Lync first, and that the installer prompted me to close Outlook.